In the 19th-century, minstrelsy was the United States’ most popular form of live entertainment, using egregious stereotypes to appeal to racist beliefs among the masses. In the 19th-century, minstrelsy was the United States’ most popular form of live entertainment, using egregious stereotypes to appeal to racist beliefs among the masses. Frederick Douglass called blackface performers “the filthy scum of white society, who have stolen from us a complexion denied them by nature, in which to make money, and pander to the corrupt taste of their white fellow citizens.” But its objectors couldn't stop minstrelsy from permeating through mainstream culture. In fact, the term "Jim Crow" itself originates with a wildly popular 1828 blackface performance “Jump Jim Crow”. Even in our current moment, emojis, GIFs, memes, and other visuals of the social media age have given form to a new type of digital blackface. 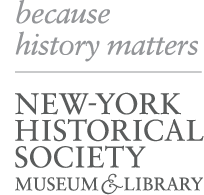 Join Dr. Eric Lott and Dr. Rhae Lynn Barnes in conversation with New-York Historical’s Dominique Jean-Louis as they trace the cultural production of stereotypes from the beginnings of minstrelsy and the Jim Crow era and discuss their impact in the modern day. Eric Lott is distinguished professor of English at the Graduate Center of the City University of New York. He is the author of the critically acclaimed and groundbreaking work Love and Theft: Blackface Minstrelsy and the American Working Class, from which Bob Dylan took the title for his 2001 album “Love and Theft.” Rhae Lynn Barnes is assistant professor of American cultural history at Princeton University. Her forthcoming book, Darkology: When the American Dream Wore Blackface, is the product of 13 years of research in 50 archives. Dominique Jean-Louis (moderator) is a curatorial project historian at the New-York Historical Society, where she worked on Black Citizenship in the Age of Jim Crow. Ages 21 and up. Wine included with ticket.